Choose one of the many designs and customise this stamp with your child's name to create a unique name stamp. 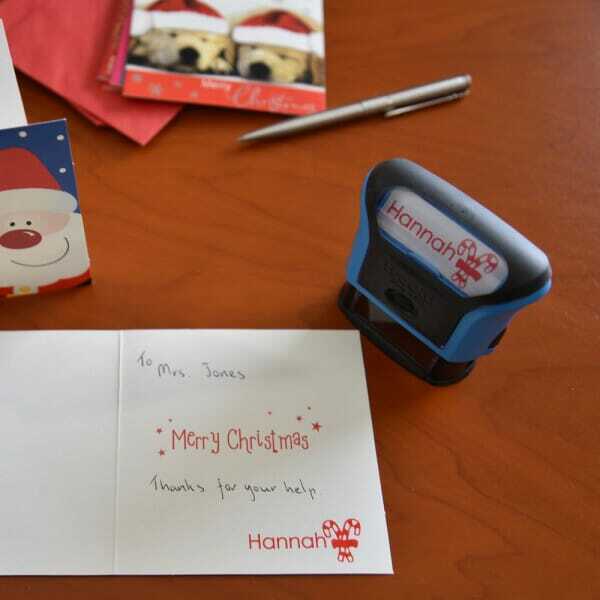 These stamps are ideal to be used on greeting cards: your children can stamp your Christmas cards themselves adding a personal touch to them without getting tired of writing their names. To personalise your stamp, simply click on 'Create your layout' to choose a design and add a name. You can choose from 34 different font types and 5 ink colours: black, blue, green, red and violet. The stamps are self-inking, which means no separate ink-pad is required leaving the little ones' hands ink free. The stamp design is child-friendly as it is easy to grip for small hands. Customer evaluation for "Children's Signature Stamp"